The opening act for Glastonbury's Pyramid Stage has been revealed, and it's definitely going to get the party started. Haçienda Classical sees the club’s original DJ partnership Graeme Park and Mike Pickering reinterpret dance classics like Blue Monday and You Got The Love with Manchester Camerata, conductor Tim Crooks and guests. The project has returned in 2017 with a new set, aired for the first time at April concerts in Leeds and Glasgow. The show’s executive producer Peter Hook comments: "After forty years in the music business I still count my three appearances at Glastonbury as the peaks of my career, to be back with Haçienda Classical in 2017 is another landmark moment and is dedicated to Tony Wilson and Rob Gretton to celebrate their contribution to British music and culture." Upcoming shows for Haçienda Classical over Summer 2017 aside from Glastonbury include London's Royal Albert Hall, Harbourside Ampitheatre Bristol, Manchester's Castlefield Arena, Kew The Music, Lytham Festival, Newcastle's Live From Times Square, Liverpool's Hope & Glory Festival and Brighton Racecourse. The news was announced on Park's website, who declared: "We’re thrilled to be opening the Pyramid Stage at Glastonbury! Oh yes!" 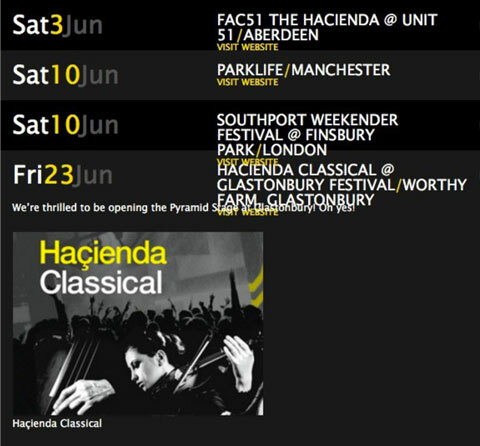 Hacienda Classical with Manchester Camerata will continue their dates throughout the UK, playing a headline slot at Manchester's Castlefield Bowl on Saturday 1 July, as part of Sounds Of The City 2017. The mini-festival will play host to the likes of Arcade Fire, Blossoms, the Levellers & The Waterboys and Hacienda Classical. The Verve legend Richard Ashcroft also takes to the stage at the famous venue on Friday 30 June, with tickets available now. Glastonbury Festival 2019: Is it too late to register for tickets?